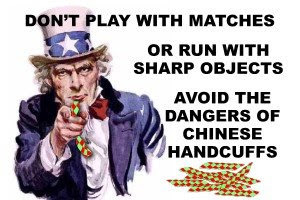 Growin’ up in Maine in the 1950’s had its share of perils, but I don’t think chinese toy handcuffs were one of them. To ignore could mean to be ignorant when it comes to all that parental childhood advice. As mentioned on another occasion, some of that sensible advice was a tad late. I do recall little sister playing with matches and bringing the fire department to Derby at least once. Down near McKusick’s general store she accidently torched a nearby field which the firemen barely managed to control, thus avoiding 1) endangering the store and 2) an arsonist rapsheet in the family. Don’t run with sharp objects made sense, too, yet didn’t stop one of my brothers and I from reenacting a television bit we saw many times on the old westerns. I don’t mean the fist fight knee deep in a lake to simulate an action scene as the good guy and bad guy tumbled from their horses and had at it. That was harmless ’cause we didn’t have a horse, and we headsnapped to fake being hit by punches, but wait… there’s more. More memorable was the knife fight scene where I handed my brother barber’s scissors (the long skinny ones), and proceeded to pretend we were cowboys again, only this time in the kitchen. “Let’s play knife fight”, I declared while handing him the scissors. I must say it was a fine piece of playacting there for a spell until he lunged and I lunged simultaneously. The shears went in on the palm side of my hand at the base of the fingers and penetrated nearly up to my wrist. Mom was not pleased. I was more embarrassed than perturbed, or injured, so I guess ignore really can mean ignorant.